Audio Technica AT-LP60-USB review | What Hi-Fi? Two budget turntables scooped What Hi-Fi? Awards last year: the traditional Rega Planar 1 (£250) and record-ripping Audio Technica AT-LP5 (£330), both more than worthy of ‘My First Turntable’ status – for those that can afford the outlay, of course. However, those with tighter purse strings didn’t have much choice beyond the four-star Lenco LP-85 (£120). Or rather, they didn’t until now. The Audio Technica AT-LP60-USB changes that, combining simple operation with a clean, balanced and organised sound and, like the aforementioned Audio Technica and Lenco, the ability to rip your vinyl to digital files. And all for the price of a handful of albums. The Audio Technica offers a more understated aesthetic to the brightly hued Lenco or suitcase-style Crosley. Its plastic chassis, available in silver or black, wears a shiny, tasteful finish, and the streamline tonearm mechanics and hood fixings mean that, at a quick glance, it could pass as a model worth twice the price. Set-up isn’t quite as straightforward as rival decks around this price, namely the Lenco and Crosley Keepsake. A little DIY is involved – the die-cast aluminium platter needs positioning and the belt attaching (no tonearm adjustment is required) – but it’s not arduous enough to put off even the most clueless novice. 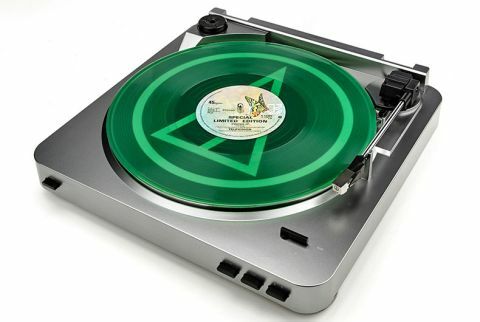 Those won over by the tactility of vinyl may even consider it a bonus! Once up and running, operation is as effortless as using a CD player. The start button on the front of the AT-LP60-USB positions and lowers the tonearm and gets the record spinning, all within about five seconds, while the stop button next to it naturally reverses the process. The button on the other side merely changes speed between 33 1/3 and 45rpm. With a phono stage built in, the Audio Technica can be plugged straight into your system or a pair of powered speakers via a RCA cable, although a switch at the back gives you the option to use an external phono stage instead, for example on your integrated amplifier. We lay down Nick Cave & The Bad Seeds’ The Boatman’s Call for the main event and while the Audio Technica is far from thin, its lack of solidity compared to the Lenco LP-85 is immediately noticeable. In Into My Arms, the gruffness of Cave’s baritone croon is well communicated, the staggered delivery of the eponymous lyric is clear, and the piano accompaniment carries warmth, but the presentation as a whole isn’t as fleshed out. That’s not the end of the world, though, especially as the Audio Technica trades its peer’s instantly gratifying boldness for better precision and organisation. As such, it’s a more articulate listen. Piano accents are well highlighted, and the flow of the simple percussion and vocal composition sounds more natural. The advantage of the AT-LP60-USB’s discipline becomes all the more apparent when Lime Tree Arbour comes into play, too; it doesn’t lose sight of faint cymbal brushes or gentle bass plucks beneath the piano harmony any more than it does the organ notes behind his intimate vocal. There is enough space between the instruments for the presentation to sound coherent, but not so much that they feel disconnected – and that equilibrium is by far a given at this price. Elsewhere, the presentation is that much cleaner than its rivals too, a fair amount of detail is dug out from albums’ grooves, and without lacking drive or energy it commits itself to a pleasingly easy listening balance. Recording from vinyl is a simple process too. Files can be ripped as 16-bit/44.1kHz or 48kHz WAVs by connecting your PC or laptop to the turntable’s USB type B output, then using the supplied Audacity software to process them. These files have a similarly even-handed character, although in terms of quality, expectations should be closer to Spotify streams than CD-ripped files. So what’s the catch? We pondered that too, albeit ultimately in vain. While we’d be grateful for a little more solidity and would still back the pricier Rega Planar 1 as the most practical starting point for anyone with a curiosity about vinyl, the Audio Technica AT-LP60-USB is an attractive entry-level deck.